Metallic thread can really add a lot of pizzazz and sparkle to a project (and if you’re a magpie like me you love anything sparkly and blingy). The pattern I’m working on in the video below is the first time I’ve used metallic thread before (DMC Light Effects floss), so I thought I’d pass on some of the tricks I learned while stitching with it. 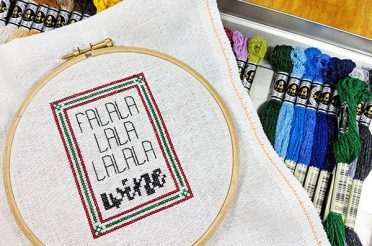 What’s the problem with metallic thread? 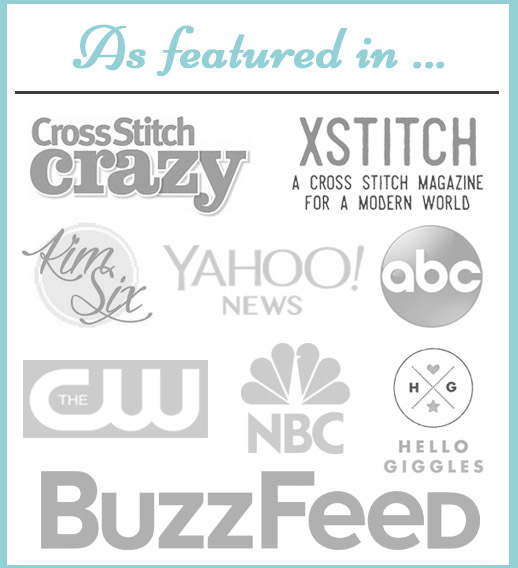 Metallic thread is incredibly beautiful and versatile. 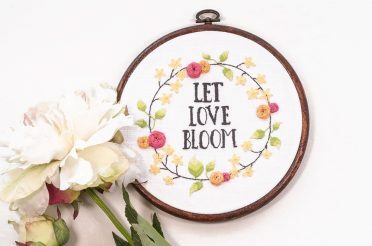 We’ve all been enamoured with projects that sparkle with metallics, or been magnetically drawn to the metallic thread section of our local craft store. However, metallic thread can have a mind of its own and is quite different to work with than cotton embroidery floss. Metallic thread is often made up of thin strands of metal and a fine central core, or sometimes metallic plastic or nylon. Because of the delicate nature of the thread, it’s really easy for the ends of the thread to start fraying. 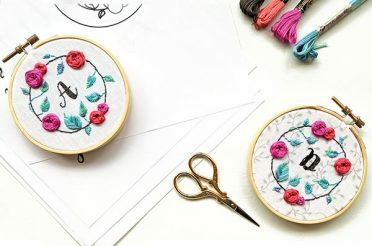 Even simply cutting the floss to length can start some of the ends fraying, leaving you wondering how to stitch with the unravelling lengths of sparkle. Also, metallic floss isn’t as smooth as regular cotton or silk floss. Its texture means it can catch against itself easier (creating tangles) or it can snag against the fabric you’re pulling it through. It’s also a little less flexible than other types of floss, so it doesn’t bend as easily without buckling and twisting against itself. 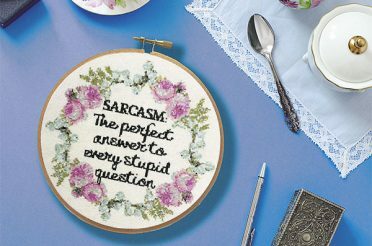 Despite these issues, you can learn to “tame” metallic thread and enjoy the lovely sparkling effects in your cross stitch and embroidery. 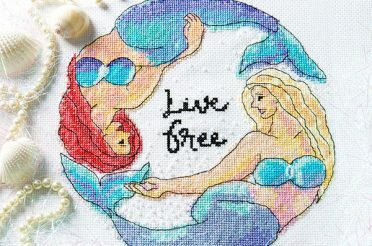 Below you’ll find a video with some tips of how to use metallic thread, not go insane, and end up with a nice sparkly project in the end. Below the video you’ll find a summary of some of the tips and tricks in the video, plus a few extras! Cut the length as half of what you would normally use with cotton or silk floss. Be very careful when removing floss from the other strands – don’t let it start to buckle as it will tangle and rough up the floss. Knot the ends rather than using the loop method (link to a video about the loop method here) — it’s the ends passing through the fabric that cause it to quickly fray and catch, and doing a pin stitch is tricky as the floss is much less flexible and it’s harder to do quick “turns”. Work slowly and try to keep stitches railroaded and untwisted as there is no “volume” to the floss when it’s metallic. The project in the video is a business and credit card holder, so it will be lined so the metallic threads don’t start rubbing against or scratching the magnetic strips. Any functional object made with metallic threads should be lined to improve its longevity. 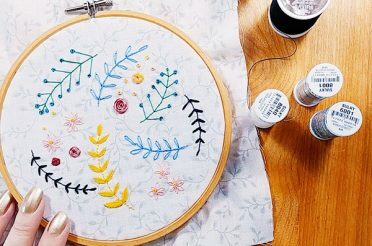 You also might need to be more careful when handling metallic thread as it is more fragile and catches more easily — store it wound on bobbins or where it won’t rub against other threads. Be careful when ironing anything with metallic thread, you may want to test a bit out first. The reason is that some metallic threads are actually plastic, so may melt or shrivel if ironed on too high of a heat. You shouldn’t have any issues washing metallic threads though. If you’re not sure, test a piece of the thread before getting the whole project wet. One tip that some stitchers swear by is to store your metallic thread in the fridge before using it, they say this makes it much easier to work with. Give it a try and see if it works for you! 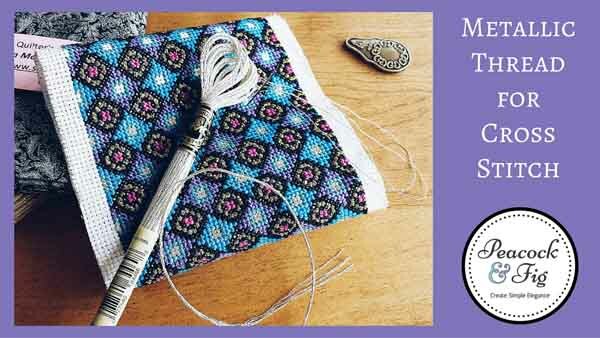 Using thread lubricant like Thread Magic can be very helpful in getting the metallic thread to slide through your fabric more easily and without snagging or tangling. If you have any questions or comments, of course please let me know in the comments section below! If you’d like to sign up to the VIP Club (now the Peacock Lounge) I mentioned in the video, click the image below! 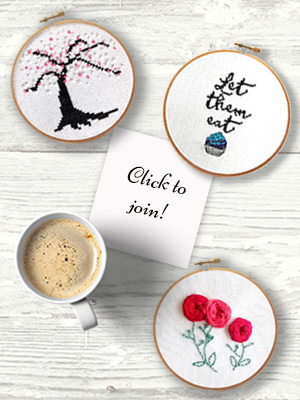 You’ll get access to free cross stitch patterns and more! 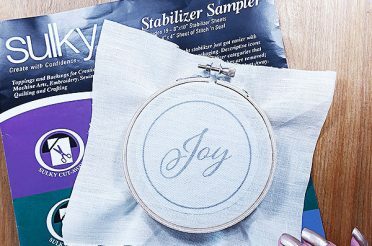 Metallic thread can be tricky to work with, but these tips and tricks will have you adding sparkle to your cross stitch or embroidery projects in no time! 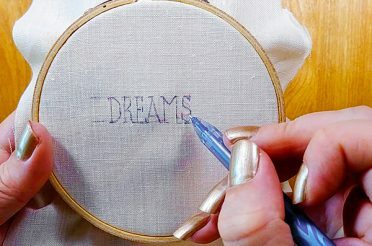 These tips were really great as I am about to start a piece that uses metallic thread in the design. I was just wondering would you advise leaving that part till last?